The Ikebana boom after World War 2 was the greatest in Ikebana history. It was Sofu Teshigahara who was the driving force behind the boom. He was able to give Ikebana the status of a new brand. He was aware that promoting Ikebana as a kind of spiritual training or as training to become a good housewife would not work. It's often said that people who tend to seek status symbols such as famous brand clothes or sport cars are those with an inferiority complex. Since the Meiji Restoration Japanese have had a strong inferiority complex towards Western cultures. Western literature, films or even religions were eagerly taken up by the Japanese as if they were commercial brands. Under such conditions how could it be possible to promote Ikebana? 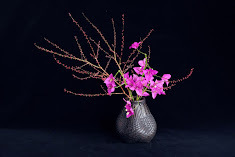 It would certainly not be effective to promote Ikebana as Japanese traditional culture. The magic word Sofu came up with was ART. Declaring that Ikebana is an art made it possible to attract over 5 million people. It has to be noted that the art at the time meant Western art. Although art was a truly a magic word to promote Ikebana, it was a curse for Ikebana at the same time. I’ll talk more about the relationship between Ikebana and art in the next issues. This is a work I made for Hanabishi restaurant in Melbourne city. The restaurant introduced a special set menu of $68, which I highly recommend. I hope you will enjoy their refined dishes as well as my flower. I also hope that more business owners will display Ikebana for their shops or offices. There are many Ikebana artists who would like to challenge such opportunities and their fees are usually very reasonable.